Hello my friends I have not blogged in a while school holidays etc. this is one of a few Christmas cards I have been making. I hope you like it. I love the snow flake embossing folder and I think it may get a lot of use this year .Thanks for stopping by comment great fully received . What an absolutely beautiful Christmas card it is as well! I love the tag in a paper that makes it look like a Christmas present! Aww, what a lovely card Lyn. Love the image, colours and layout. Thanks for joining in The Cupboard Trilogy challenge. Beautiful card Lyn and really festive. Thanks for taking part in the Cupboard Trilogy Challenge. Morning hun, lovely to see you back in blog land. :) Your Christmas card is gorgeous and loving the embossed background too. What a lovely christmas card, I love the uses of embossing on them. Thanks for joining in with blog. Gorgeous card. Love that image and the layout. 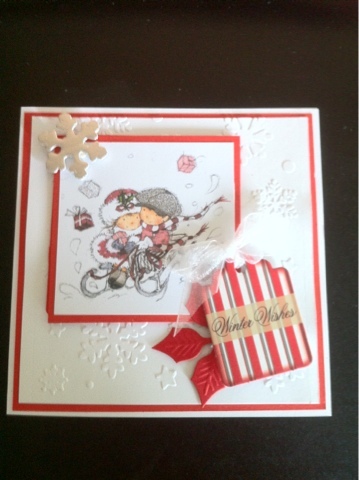 Great card Lyn - love the snowflake embossing folder = you will have to let Kate know where you got it from. 'cos think I NEED one too!